Jungle Red Writers: A bissle brisket for the holiday? HALLIE EPHRON: Every household has its holiday traditions, and mine (big surprise) are all about food. Two days before Christmas finds me making dark chocolate-dipped orange rind. Gifts for my husband and son in law. Christmas eve I'm cooking up a savory brisket with mushrooms and onions and carrots that I'm going to serve with crispy potato pancakes. For dessert, mandelbrot -- biscotti-like cookies studded with almonds, maraschino cherries, and chocolate chips. Usually this menu makes sense because Hanuka overlaps Christmas. This year it's confusing because Hanuka was too damned early but no one messes with my Thanksgiving turkey. Christmas morning: I'm baking sticky buns (assembled the day before and waiting in the fridge). The smell brings everyone downstairs to open gifts... which we pretty much limit to stocking stuffers. But lots of them. This year we have a baby in the house and I know she's going to revel in the wrapping paper, boxes, and ribbons. Looking forward to finding out what she thinks of sticky buns (hold the nuts). Until now her parents have kept her away from sweets. The day after Christmas: Leftovers! If there are any. This savory pot roast cooks slowly and creates its own juices. I serve it with crispy potato pancakes (and sour cream). 1. In a Dutch oven over medium/high heat, sear the brisket in the oil on both sides until browned. Remove from pan and turn off the burner. 2. Layer the onion slices on the bottom of the pot. 3. Put the brisket back in on top of the onions, fat side up. Spread carrots and mushrooms over the top. 4. Sprinkle with soup mix, then dump on the chili sauce, then beer. Slosh it around. 5. Cover and cook in a 325-degree oven or on top of the stove over low heat for 2 1/2 to 3 hours or until fork tender. 6. Slice the meat and serve it on a platter with mounds of vegetables on the sides and the juices in a gravy boat. Children always make Christmas celebrations extra-special . . . I’m sure your little one will love the sticky buns! And the brisket sounds so good . . . thanks for the recipe. Beat one-half cup butter until soft; gradually add one cup sugar, blending until creamy. Beat in, one at a time, six eggs. Combine one cup raisins, currants, and pecans; sprinkle lightly with flour; add to the butter/egg mixture. 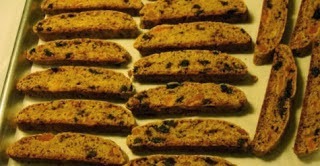 Combine two cups bread crumbs, two teaspoons cinnamon, one-half teaspoon cloves, one-half teaspoon allspice. Stir the bread mixture into the butter/egg mixture; pour into a greased baking dish. Bake at three hundred seventy-five degrees for about half an hour. We always have homemade cinnamon rolls for Christmas breakfast, with bacon and scrambled eggs. Plus mimosas. So wishing I had a grandbaby in the house, but it just doesn't seem to be happening yet. So our 4- and 7-year old friends are stopping by, instead, to visit and raid the candy canes off the tree. That brisket sounds great! But my wife screams at me whenever I get the chili sauce out. I may have over seasoned some things in the past. :) It doesn't come out spicy hot, does it? We do the Italian thing here: All fish on Christmas Eve -- shrimp, raw clams, crab legs, and lobster followed by deep friend scallops, plus spaghetti and clams. Lasagna and roast beef on Christmas Day, which is the cat's favorite day of the year as there are always a couple of leftover shrimp and crab claws. She goes nuts with the crab claws, playing with them like they're still alive. That brisket looks divine! I'm going to try it. Menu for Christmas is always the same: seafood gumbo and assorted unhealthy appetizer and desserts. Christmas is not the time to consider your arteries at my house. I have a super duper easy and excellent recipe for pulled pork. I'll save that for New Year's. Jack, Heinz chili sauce is NOT hot!It's basically sweet and there's no actual chilis in it. It's basically cocktail sauce. Over in the supermarket with the ketchup. Joan: question for you. Breadcrumbs? Do you make them? Buy them? Like what you might bread fish or veal with?? Oooooh, I've had that brisket Hallie, and those cookies too--recommend them both! No Jack, the brisket isn't spicy. Growing up we always had turkey on Christmas. A second Thanksgiving dinner. As we got older we switched to ham - and turkey. Now that we don't celebrate Christmas as a big family gathering there are few traditions. My husband and I have been going to an inn in New Hampshire for the past few years. They have a small Christmas tree in each room and their meals are special. It's Currier and Ives beautiful. I have never cooked brisket. I will definitely try this recipe. 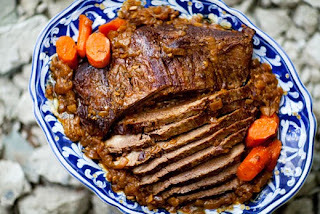 I don't believe I've ever had brisket, but your recipe makes me think I need to give it a try. We don't have any hard and fast food traditions, though we often have Danish Puff Pastry (recipe in the Betty Crocker cookbook) for breakfast as we open gifts. It is as devoid of nutrition as you can get and still call it food, but I love it. A flour and butter crust topped with an eggy puff similar to the shell of a cream puff, glazed with an almond flavored powdered sugar mixture, and sprinkled with slivered almonds - mmmmmm. Your brisket sounds delish, Hallie, yum!!! Traditions and food go hand in hand at our house also, and Christmas at the Barley home means a breakfast strata I put together Christmas Eve evening and leave in the fridge overnight. Christmas dinner is a ham and all the fixin's. So I just got back from the market... got there at 8 AM and already the parking lot was half full. Hugs to my local Stop and Shop in North Quincy: aisles were FULL of shoppers but checkout lines were a breeze. And as I realize reading the comments I forgot the chili sauce. Shoot. We were JUST talking about brisket! Never thought of brisket for Christmas, but I do make it for Passover (and sometimes for the High Holy Days). My mom used to make a savory brisket for most of the time I was growing up, but sometime in the Eighties, she switched to a sweet brisket, which is the one I make. Sauce includes a small can of tomato sauce, carrots, onions, brown sugar, ketchup, and prunes. And it is to die for! I go to a friend's home for Christmas dinner. He has been doing it for about 40 years, and it used to be positively Dickensian. Fewer people now, and fewer dishes, but still a turkey and a ham and a smoked salmon and lots of shrimp and all the trimmings-- and all I have to do is climb three flights to his apartment. That sounds lovely Ellen -- Smoked salmon and shrimp! 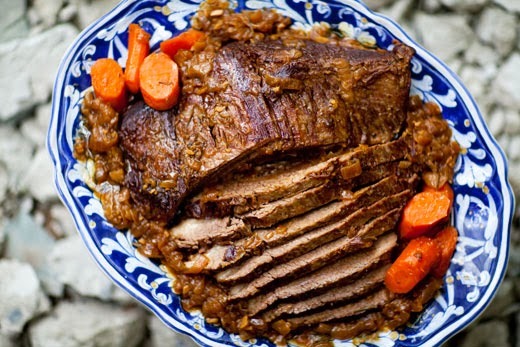 Your brisket sounds lovely, especially the prunes give it a sephardic twist. Yes, bread crumbs. The recipe is right out of my Joy of Cooking. When it gets close to Christmas, I set out some bread to get slightly stale and make the bread crumbs from that and, yes, it's crumbs like you would use for breading. The consistency of the pudding is not like bread pudding [for which I break the bread into medium-sized chunks] . . . its closer to the consistency of cake . . . .
John came home the other day with a packaged Classic Christmas Pudding, made in England by Fosters Traditional Foods, Limited . . . and it, too, is made with bread crumbs . . . .
Wow, Ellen - that recipe sounds SOOO rich and delicious. My kind of fruitcake. Where all you need is a little bite at a time. Hallie, that black cake is to die for! I had to test the recipe to do the article, and it makes a huge amount, but in for a penny, in for a pound if you're going to bother to do it at all. I test all recipes before writing a food article, and after making the variations mentioned, I gave away fruitcake to everyone for Christmas that year and even mailed one to each of my sisters, then living on both coasts. Ellen, if there's any fruitcake left over, bring some with you to Cincinnati, okay? I'd love to try a new kind. I made a Hungarian sour milk coffeecake for Christmas morning every year, until my three daughters decided they liked Pillsbury cinnamon rolls best. Which is a travesty, as far as I'm concerned, but way less work. They also like mimosas, but my husband and I much prefer coffee or cocoa. This year we're having smoked wild turkey (shot by my husband this past spring), pheasant breast (also shot by him), and fruited pork loin. Leftovers galore! Hallie, what fun, to have a little one around for the holiday! Karen, there is one in the freezer, but I'm not sure how it is holding up. I was actually thinking about pulling it out today or tomorrow and defrosting it. Do you use juniper berries for the wild game? Sometimes I use juniper berries. For a big party we had at Halloween I made a huge vat of venison stew and I slow-cooked the meat with juniper berries. And I just gathered a whole bunch from the trees at our farm. Do you need some? Thanks, Karen, but I have some (gift from a nice man in the spice business that I interviewed). I haven't cooked venison in 45 years, or had any other wild game since then, but I had heard that juniper berries were good for the gaminess, and I was just wondering.